Published on April 10, 2011 April 10, 2011 by Kristina @ Family. Work. Life. 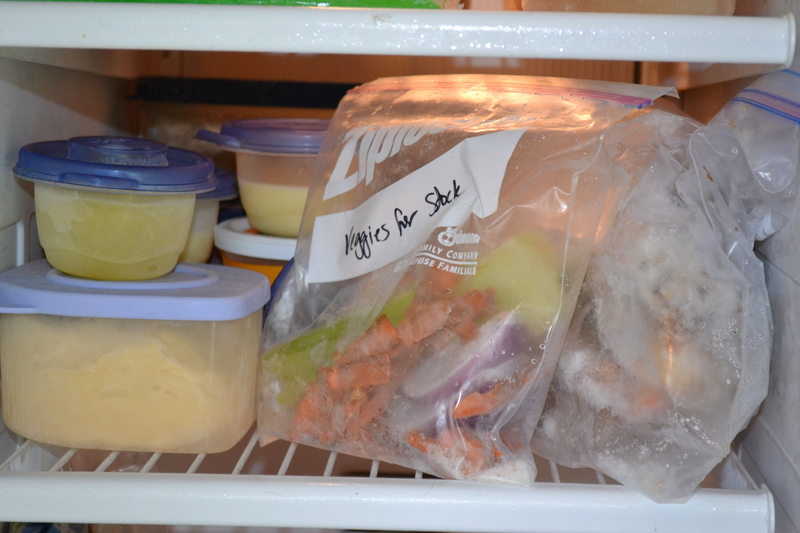 I have a lot of things around the house that save me both time & money in my day-to-day household operations, but none as effectively as my freezer. Subsequently today I move my musings from the theoretical to the practical, and salute my favorite kitchen appliance. 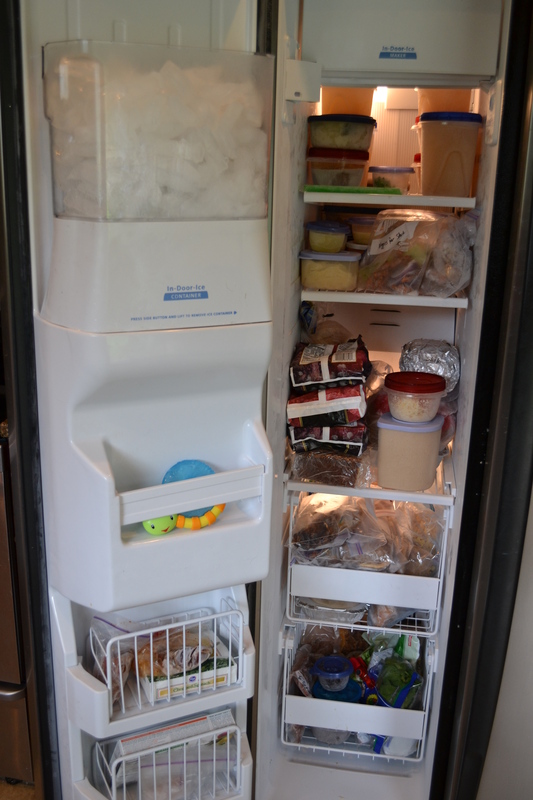 We don’t have a deep freeze, just a side-by-side refrigerator/freezer. Sometimes I think it would be nice to have one, but it’s not exactly necessary. I’m not one of those people who buys in bulk when things are on sale; I can’t really tell if something is a great deal. Is $1.99 a good price for chicken? I have no idea. If I need chicken, I’ll buy chicken – I don’t care what it costs. 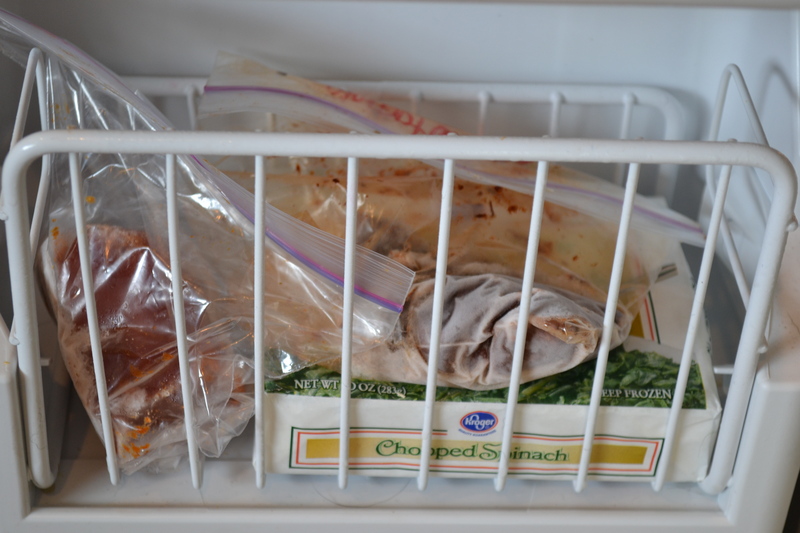 I’ve found other ways to make my freezer work for me. This is where I keep all my chicken stock. It’s one of the 3 things I won’t buy from the grocery store, so I always keep a pretty good supply. We also have a banana that was no longer edible so he is waiting for a couple more friends to join him to eventually become banana bread. There are single-portion leftovers of soup & chili so if we don’t have leftovers for lunch one day, we can just grab one of these from the freezer to avoid buying lunch. There is some chopped jalapeno – I always chop & freeze leftover veggies if I can’t use them all before they go bad in the fridge. It’s pretty common to have chopped onions, tomatoes, or peppers here…not only does it save the veggie, but the next time I need to saute an onion for a recipe, it’s already pre-chopped! Finally, an Otter Pop. Of course there is, I have a 2-year-old. Shelf Number Two contains (at this moment) 2 chicken carcasses which will be turned into stock as needed, at which time they will graduate to the top shelf. I also keep a bag of veggie pieces that I can’t use in cooking, but can add to the stock when I cook it. Way in the back is a big container of chili, just waiting for a quick weeknight dinner when I either don’t have time to cook, or frankly just don’t feel like it. It’s still delicious and a heck of a lot cheaper than picking something up or going out to eat. I also have a container of frozen lemon juice (what else are you supposed to do with the rest of the lemon after you use the 1 1/2 teaspoons that are called for in the recipe? ), so I can stretch one lemon pretty far. Finally, I have a ball of frozen pizza dough for an easy pizza night. The recipe I use for the dough makes enough for 2 pizzas, so I use one and freeze the second. This shelf has a ready-to-cook casserole, a whole (uncooked) chicken, and frozen fruit to go in Rusty’s daily yogurt. There is a also 1/2 a pound cake from, obviously, a time we had pound cake but didn’t eat the whole thing. 🙂 Finally, I have loaves of bread, breadcrumbs (salvaged from a loaf that was no longer edible), and a big container of yeast. Since bread products are the second item I won’t purchase from grocery stores, I bake quite a bit. Thus, I bought a huge container of yeast from Amazon (it’s expensive in those teeny little grocery store jars!!!) 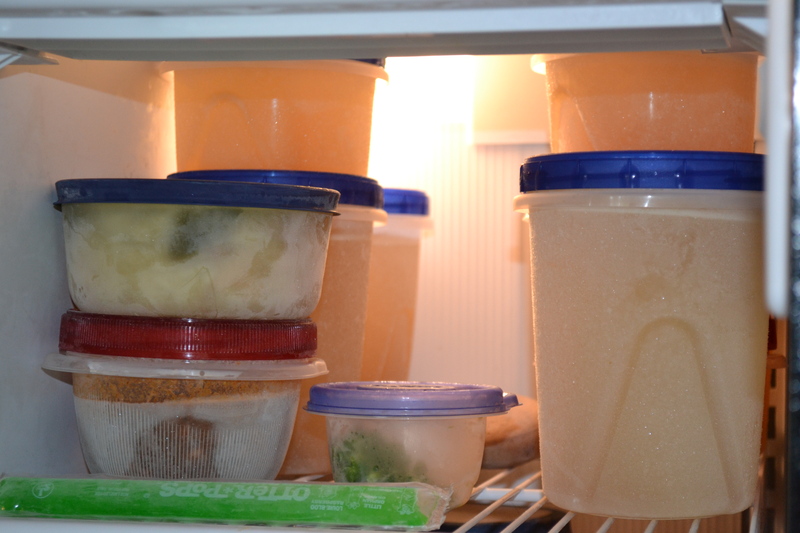 and preserve it in my freezer – moving smaller portions to the container in the fridge as I need it. Since I do bake all of our bread (and enjoy baking it), I never want it to become a chore. To prevent that from happening I just make sure I always have a good supply in the freezer. That way I never have a weekend where I think, “Oh my gosh, I have to do X, Y, Z, and bake bread” and wind up all stressed out. If we do plan to have a loaf of French bread on a weeknight, I’ll make & half-bake it during the weekend, freeze it, and finish baking it on whatever night we need it so it’s nice and fresh out of the oven, even on a Wednesday night. Saves $$$ and my sanity during the week! I did Dream Dinners for quite some time, and have a few leftover meals here in Drawer #1. They are great for a quick weeknight meal. I highly recommend it – I don’t do it anymore because my life no longer necessitates it, but would encourage anyone to check it out! 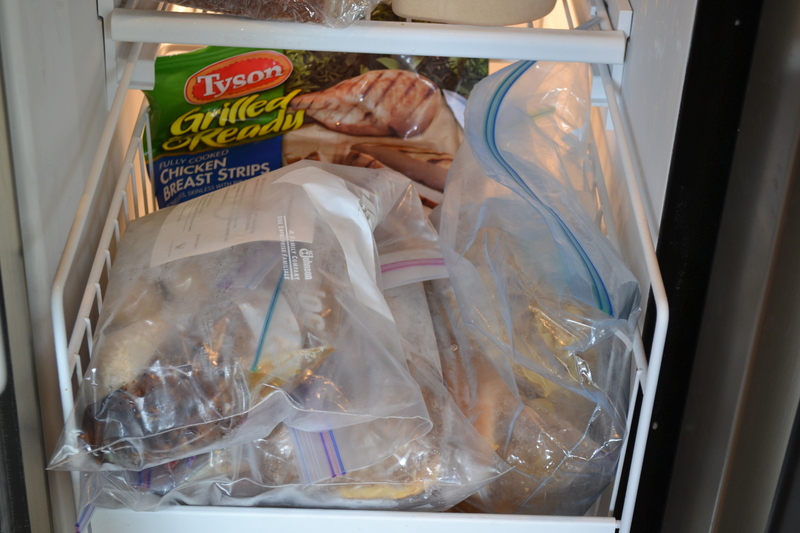 I also buy frozen pre-cooked chicken on occasion because it is so easy in soups and casseroles. Unbelievably expensive, I know, but I’m willing to splurge on it once in awhile to make my life easier. Here lies most everything else: frozen veggies, fresh spinach (couldn’t be used in salads anymore, but can be thrown into soups & cooked dishes), a small serving of taco meat, and a pre-made asian sauce. I also found a food vacuum sealer at Goodwill and have preserved steak, chicken, meatball mix, pre-made taco meat, sliced & marinated raw stir-fry meat, and pre-cooked meatballs. Often when I cook, I’ll make extra servings with the intention of freezing them either at the fully-cooked stage or just at the fully-prepped stage. It doesn’t take me any extra time and lets us have homemade meals on nights that are a little more rushed! Again, a great way to avoid eating unhealthy & expensive takeout. 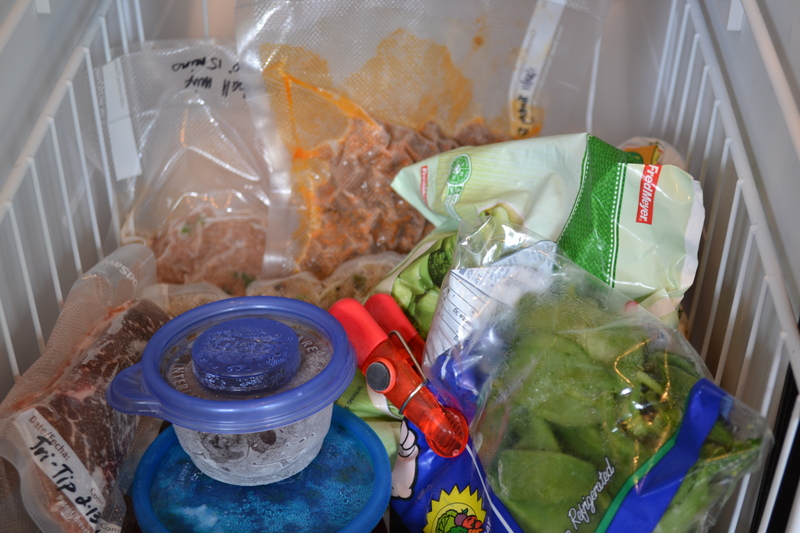 Chipotle chiles in adobo & tomato paste get stored in ziplocs, just waiting for another recipe to call for them. Who uses a whole can of chiles in one dish (and has any taste buds left)? I’m certainly not going to use 2 tablespoons and throw away a whole 1/2 cup of them that can be used in a future recipe! 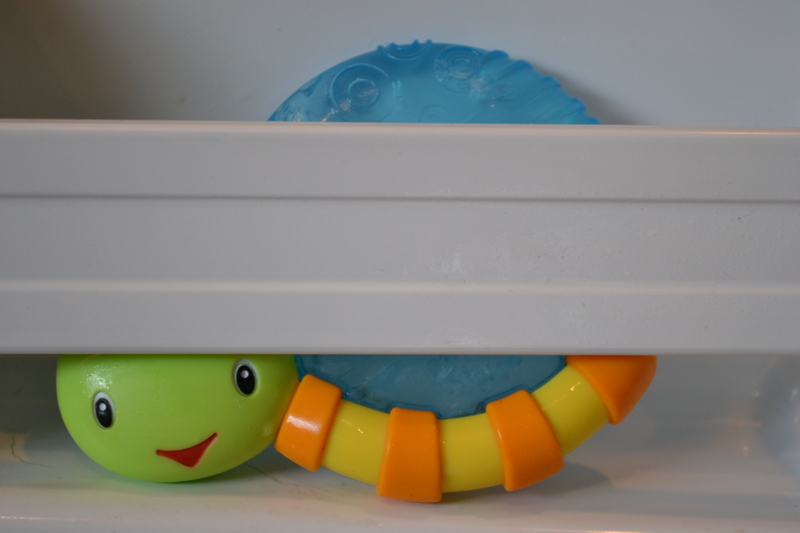 My son never liked cold teethers, so he never got used. And I don’t need him now. Really, he could move out any time. 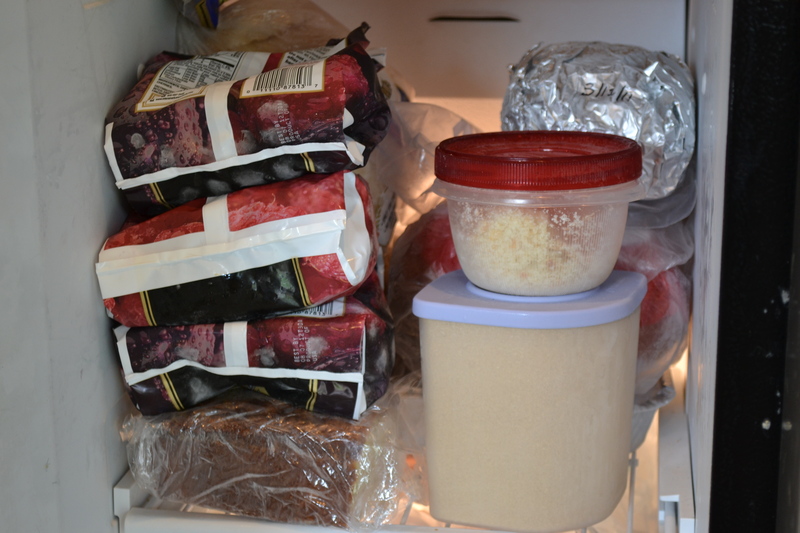 And that, my friends, concludes this lengthy tour of my freezer – along with a few tips on how I use it to keep my life (and budget) manageable. I hope you found something of value in here. Thanks for listening! Pingback: Food Waste Friday – 4.22.11 | Family. Work. Life.